Wanted to write a few original posts on children’s books. Here’s an odd tale of a SF series from the 1970s — and how its ending was changed in a different medium. …and THE WITCHES OF WORM, where a young girl adopts a stray cat she becomes convinced is a witch’s familiar that’s forcing her to misbehave (cleverly, the book never resolves whether this is all in her head). In 1970, Snyder did a book called THE CHANGELING, about the friendship between two young girls from different social circles. In 1975, Snyder decided to flesh out this idea, and wrote an actual novel set in this world called BELOW THE ROOT. The story is about an alien race that lives in a system of giant trees, and whose children have psychic powers. They encounter another group of beings that live outside teh trees on the surface, whose values conflict with their own. The characters appeared through three books, collectively known as the Green Sky Trilogy. In the final book in the series, the main character Raamo dies when he falls into a lake. Kids and their parents were quite upset by this, and let Snyder know it in letters and such. Snyder herself regretted the decision, but the book was already out, and there was no changing the ending. A few years later, computer games had become more popular, and Snyder was contacted by a fan of her work named Dale Disharoon. Disharoon wound up working with Snyder to develop a computer game version of BELOW THE ROOT that took place after the events of the trilogy. Snyder herself wrote the storyline for the game, and considered it an official part of the series. But what’s really interesting is that Snyder used the game to retroactively change the trilogy’s ending! 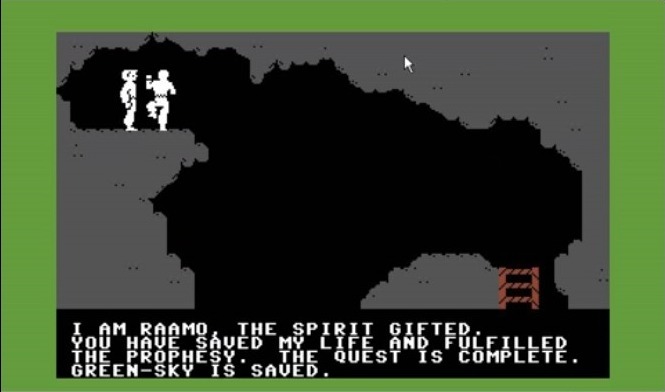 In the climax of the game, your character finds out that Raamo is still alive, just stuck in a subterranean cave. You win the game by rescuing him! How crazy is that? Imagine all the deceased characters from other books/films/TV shows that could be resurrected that way, by finishing a computer game! The Green Sky Trilogy is currently out of print in hard copy form, but you can get Kindle Editions on Amazon. If you read the original trilogy and was bummed that Raamo died at the end, hope this gives you some closure — he wound up with a stay of execution!